Inkscape is a free Open Source vector graphics illustration application that works similar to Adobe Illustrator. Unlike a raster graphics drawing application, a vector graphics editor allows you to use your mouse to edit your image by selecting and dragging points on the geometrical objects in the image. Inkscape supports features like shapes, paths, text, text-on-path, flowed text, transforms, layers, gradients, gaussian blur, alpha blending, bitmap tracing, and much more. It be used for creating images such as icons, flags, logos, maps, diagrams, etc., and through use of Gaussian blur, its capable of producing images of near photographic quality. Inkscape is an Open Source application that comes in versions for Microsoft Windows, Linux, Mac OS X, and other operating systems. It can be downloaded for free from the Inkscape website. 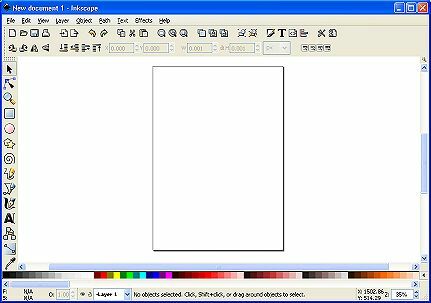 In this article you'll learn your way around the Inkscape interface, including its toolbars and menus. You'll learn how to zoom and pan to navigate your drawing canvas. And you'll learn how to save and open your drawing files. Shown above is the Inkscape main window. At the top of the window is the main menu bar, which contains the usual File, Edit, and View menus, along with menus specific to vector drawing, including Layer, Object, Path, Text, and Effects. The Help menu contains several very good tutorials. Below the main menu bar is the Command Bar. It provides many functions similar to the main menu bar, except in a button format. Below the Command Bar is the Tool Control Bar which provides you with commands related to the currently selected tool in the toolbox. On the left side of the main window is the Toolbox. The Toolbox contains buttons that let you access the vector drawing tools provided. At the top of the Toolbox is the Select Tool which is used to select areas and objects. Below that is the Node/Handle tool, which is used to select and control nodes and handles. The Toolbox also contains icons to draw various shapes, lines, and curves, along with tools to create calligraphic lines, text, and gradients. The best way to learn these tools is to experiment with them. At the bottom of the window is the Palette. The Palette provides a way to change an object's fill colour or stroke color. Below the Palette is the Bottom Toolbar which contains controls to modify the Fill and Stroke, select the Layer, set the Zoom, and it contains a Status area that provides information and help related to your current operation. In the center of the window is the drawing area, which displays the Page Border.